I live by three calendars—the one where the seasons change on the solstices and equinoxes, the traditional Celtic calendar where the seasons begin at the midpoints between, and the school calendar. After sixteen years of being a student, four years of teaching swimming for the Boston School Department, twenty-plus years of teaching bookmaking, and twenty-three years of kids' education (two kids six years apart), the year starts in September. This Wish Scroll (which is based on scrolls from Ethiopia and one of the sixteen projects in Handmade Books For A Healthy Planet) contains wishes for the new. The idea is that if the scroll is worn, the wish will come true. You can make a scroll for yourself or one for someone else. I used to use film containers but they have become less available. Now I often use used prescription containers. If you collect them from others, I suggest you ask them to remove the label. For paper, I used used copy paper with writing on one side, folded in half the long way, and then glued together. Whatever paper you use, you'll cut it to be a little taller than the container. I made the scroll before the case but in workshops, I make the case first. You'll also need tape, a piece of yarn about an arm-length long (36"/91.4 cm for those who like to measure), and a piece of paper to wrap around the case a little shorter than its height. I decorated mine before but you can also do it after the case is complete. For more decoration, I strung buttons (you can also use beads) onto a piece of crochet cotton and tied it to the yarn. 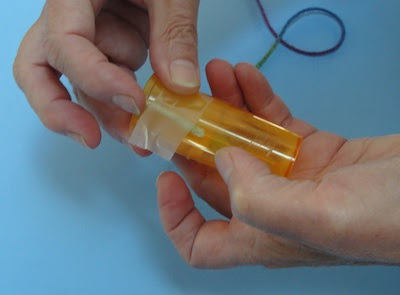 With a small piece of tape, attach one end of the yarn to the one side of the container at the top. Do the same on the opposite side. 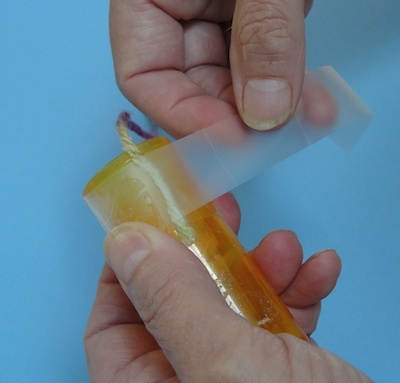 Wrap another piece of tape all around the top to help secure it. Put glue on the back side of the cover paper and attach it to the case. This is an extra touch which is fun but not necessary. If I were doing this with a group of younger children, I wouldn't do it unless I had a lot of extra adults to help. 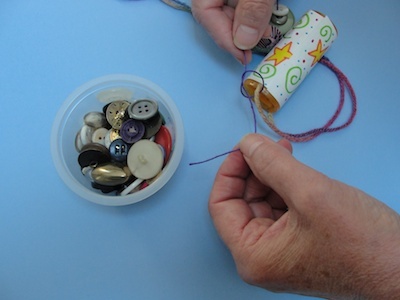 Thread buttons or beads onto a piece of thread. I used crochet cotton. For most buttons you need something thinner than yarn. Tie the end of the thread around the yarn on one side of the case near the top. Tie the other end of the thread to the other side. 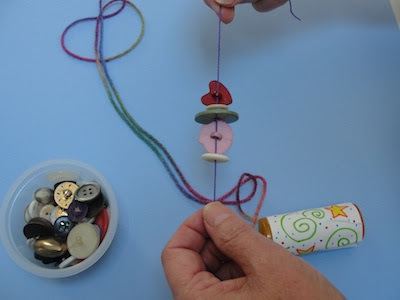 This is a little trickier because you need to keep the beads on the thread and have the thread an appropriate length when you tie it. Roll up the scroll and put it in the case. You can find ideas for a Wish Scroll here. 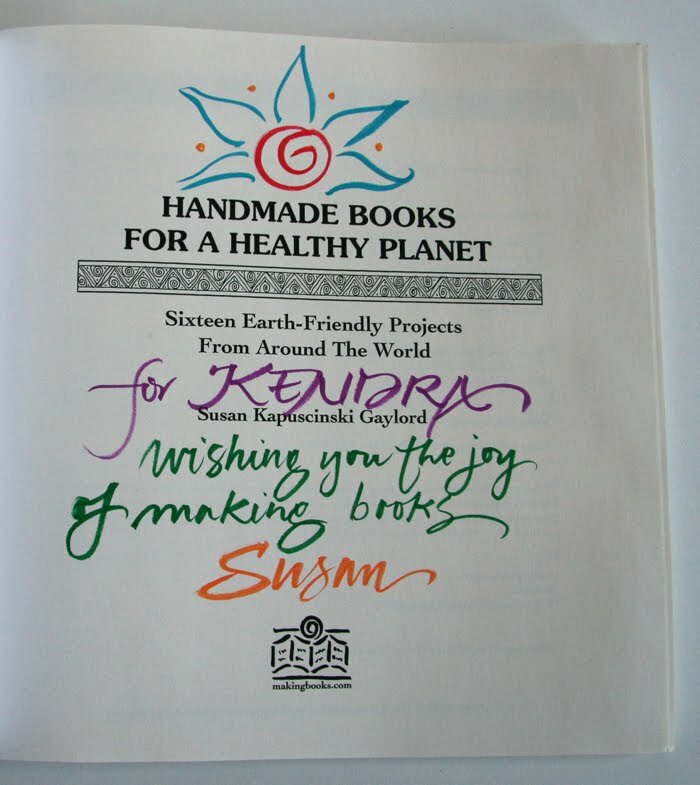 A signed copy of Handmade Books For A Healthy Planet to a randomly drawn commenter. Please make sure your email address is in the comment so I can contact you. You can write out the word at to avoid spammers. The Giveaway will close on Saturday, 9.3,11, at midnight. our next swap has the "Scrolls" theme - due to the host October 1; she then swaps out 3 for 3. Thanks for the wonderful emails...now I'll follow to your blog to keep up with your great book projects. The wish scroll is an excellent idea...I have someone right now that I'd like to give one for best wishes. I've enjoyed your makingbooks email very much and have linked it to my creative arts in early childhood education class. Hopefully they will follow up as you move away from sharing in this format. Making books from recycled materials certainly helps them connect integrate curriculum easily! Wonderful ideas! I would love to win the free book. Thank you for all you do to help us create in a way that helps the planet. I have looked forward to all your postings with anticipation and joy. I have used many of the ideas in my art classes. Thank you for the inspiration! Hi Susan, I've enjoyed your emails so much over the past few years. You've given me so many ideas to help me work with my special needs child. I'm glad I can still keep up with your work via your blog. 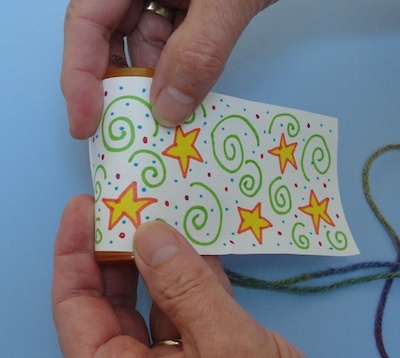 The scroll idea is lovely and can be used so many ways. I can't wait to share it with my teacher ed. students! Wish scroll is such a great finish for your monthly effort! Thanks for sharing this plus all your bookmaking ideas. Sorry to see the newsletter go, so I have subscibed to your blog. 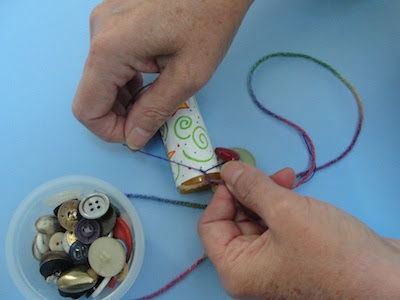 Love the scroll idea, I will be using it with my room mates little girl to help her make something for her Mother's birthday. What a great idea. I am leaving today for a Silent Retreat weekend and this will make a very nice handwork project with reflection of what I do indeed wish for. Thank you for all the great ideas. It's the beginning of spring here in Sydney with such a feeling of posssibility in the air along with the heady scent of jasmine. "May your coming year be filled with magic and dreams and good madness. I hope you read some fine books and kiss someone who thinks you're wonderful, and don't forget to make some art - write or﻿ draw or build or sing or live as only you can. May your coming year be a wonderful thing in which you dream both dangerously and outrageously. I hope it'll make something that didn't exist before you made it, that you will be loved and you will be liked and you will have people to love and to like in return. And most importantly, because I think there should be more kindness and more wisdom in﻿ the world right now - I hope that you will, when you need to be, be wise and that you will always be kind. And I hope that somewhere in the next year you surprise yourself." This is wonderful (the scroll project, not that you'll be ceasing the monthly newsletter, though I subscribe to both and won't have to fear missing anything). I first made a scroll book with my 4-year old niece. She thought it was the greatest thing ever. Now that she's older, this would be a perfect reminder for her of what lies ahead and what fun we've had together over the years. Thanks for your generosity in so many aspects -- and thanks for letting us play along. Even though I am an art teacher I use so many of your ideas with my art student as I feel writing is important in any subject. Thanks for all the wonderful project ideas. What a wonderful "prescription" for a new year! Thank you for the years of Making Books Monthly. I've so enjoyed it and will continue to follow your blog. 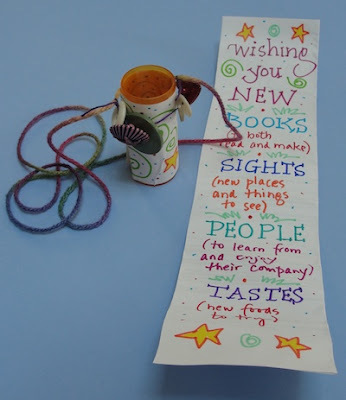 I love this scroll idea to make with the kids where I work at a youth center. It just so happens that someone just donated a ton of prescription bottles! So we're all set! Thanks for the many emails and for sharing your wonderful ideas. I look forward to following your blog! 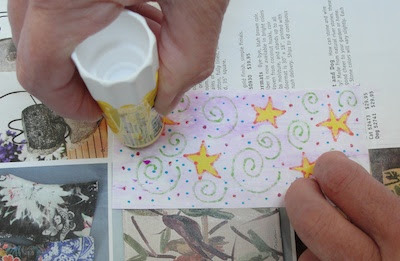 Thank you Susan for offering this lovely little scroll book idea! I work with groups who wish to learn more about the values of walking the labyrinth (and there are so many! ), and the only creative feedback tools that have been used so far have been sketchbooks for drawing/pastel-ing, etc., and journal pages. The walkers can choose to leave their art in the sketchbook or to take them with them, but I can see how using your scroll book idea would be a great way to wrap up the labyrinth experience in a very personal, in the moment sort of way for each person. I will be using your idea this month at an autumn equinox labyrinth walk. 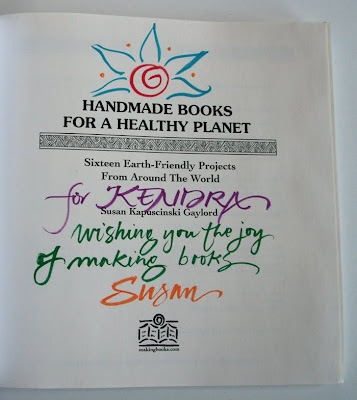 Thanks again, and I would LOVE to be the happy recipient of your Books for a Healthy Planet book! I have enjoyed all your postings and tutorials, have used many of the ideas with my students, and have shared your ideas with fellow teachers. Thank you so much for the inspiration. You are one of my regular reads. A blog is a great idea! I look forward to following it! Thanks for all your generous tips and information through your newsletter and blog. I am an avid bookbinder and relish learning from others of their inspirations and techniques. 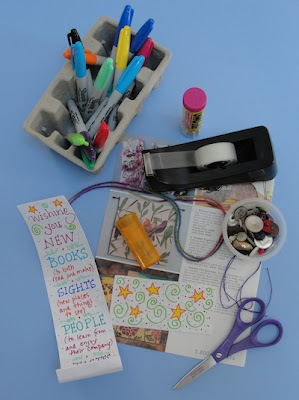 I am teaching a 5-day "Recycle Art" in bookarts and mixed media in November, and would love a copy of your book to display in the classroom... and perhaps try a technique or two with the class. I am always inspired by your ideas and have enjoyed applying them. I would love a chance at the book. I love your bookmaking projects. Can't wait to do some more with a new group of kids this fall. Hi Susan, thanks for sending out the blog information today. 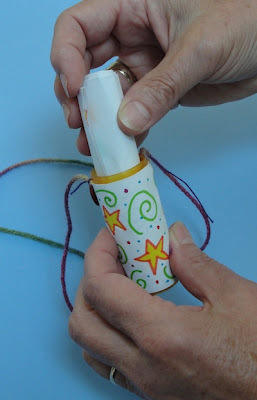 I made wish scrolls with my kids (K-5) two years ago at Thanksgiving - they were Thankful Scrolls. :) I used TP tubes instead of pill bottles. The kids really liked the project. Please enter lpskeen AT gmail.com for the drawing. Thanks. I'm so happy to be following your blog! The scroll project is a cool idea; thanks for sharing. Please enter me in the blog giveaway. I'd love to win. Your newsletter always brightens my inbox...i'll miss it. But i have so many ways to remember ... the word a day journal i do every year, the hot dog book i taught my grandchildren, students, clients and on and on, and now this wonderful scroll! Love, love, love it. Thanks for the you you bring into this world...you make it a much brighter place in which to live. I will miss your emails but definitely will enjoy your blog. I love that there is another person in the world who enjoys and NEEDS to use her hands and creative mind to be expressive and beautiful. As a retired teacher I find getting kids involved in creating something from themselves is so difficult. In an age where they want to work or play with materials that have speak to them and show them everything, it takes a lot of work to show them there is another way. Thank you for being there to support and extend these concepts. I am encouraged to find people like you still exist. I've enjoyed making several of your books and would love to have a copy of your book. Thanks! Susan I've enjoyed the newsletters so much but I wont miss them as I subscribed for the blog to be emailed to me...I would love to win your book! You can reach me at PhareCamp at imp-s dot com. The wish scroll looks like fun. I wanted to tell you about our First Day School class at our Quaker Meeting. We combined the stick & elastic book activity with using recycled cereal boxes and wrapping paper (also recycled and/or the small pieces you get in the mail from organizations asking for donations - e.g. World Wildlife Fund) We cut the large sides of the boxes into covers, covered the outside with the wrapping paper and used construction paper for the inside cover endpapers. The writing paper was recycled z-fold paper from the old pin-feed computer printers. We used tongue depressors for the sticks. Since many early Quakers wrote journals, this was a great activity to create journals for the children. Everyone was very pleased with the results. As a fellow Art teacher, newly retired also, want to thank you for the many words and ideas you've shared with us. You have been an inspiration! Would LOVE to receive your book!! Susan-I adore your blog ! you have given me so many fun projects to do with my grandson-arts & crafts with boys that are interesting to them is not easy find-but these little book projects are just right for all ! Hi Susan-I will miss your emails but will use your blog. I believe you introduced me to the simple 'hotdog' book, which I love to use as a library program for kids. Susan, I've loved your ideas ever since I found you. I would love to be considered for the giveaway and keep up the great ideas. Thank you, Susan, for all of your ideas for book-making. Every year many of our projects lend themselves to the designs you have created. 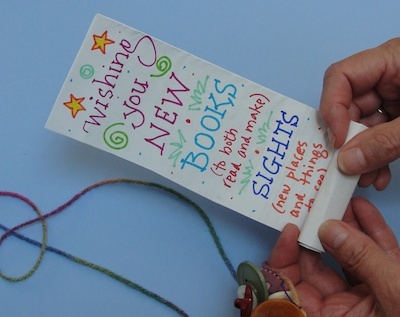 This scroll book would be great as a back-to-school idea. The book would be perfect as a welcome gift for a new teacher! I love this project! My sister sent me the link to your blog yesterday. I'd love to enter the drawing. Loved everything you shared. Will look for your blog. I sooooo love making books. Thanks for all the sharing you do. I will look forward to your blog. Thank you for being generous with sharing a piece of your talent with us. I love your site and will miss your email newsletter. This scroll is perfect for birthday wishes and celebrations. Can imagine it in all kinds of sizes and materials. Thank you for sharing your creative inspirations with us. Susan, Thank you so much for sharing. I've started making art books...a fledgling attempt. I would be thrilled to win a copy of your book. Mahalo for Making Books, mahalo for your blog, mahalo for sharing your ideas, and mahalo for the op to win your book. Thanks so much for the great ideas. I teach social studies at a Title One Middle School. We do not have an art program so I started buying art supplies and staying after school for "art club". Since our club is self- funded I'm always looking for inexpensive projects that my students will enjoy. I think that wish scrolls may be the next big thing at our school! Thanks for continuing to inspire at your blog! Would love to win the book, too. Hi, Susan - I am sorry to see the monthly newsletter end - but I am really glad you will continue with a blog! I have made some of your projects with my students - I really enjoyed meeting you at the Massachusetts Reading Teachers Convention! I plan to make the wish scroll for myself first, then to share it! Thanks again for all the great ideas!!! I have followed every issue you sent through the email and created delightful products with my students due to your inspirational ideas. I am excited about your new blog. It has a crisp and new image - sharp! I have thoroughly enjoyed your newsletter and wish you all the best with the blog. Thanks for the opportunity to be in the draw for your book! I'm excited to make a scroll! Thanks you. I think we still have film canisters at our house. Transitions are a wonderful thing and I look forward to reading your blog. Like all good things Making Books Monthly must come to an end. We will gladly look forward to your blog and continue to share making book ideas with children an adults alike. 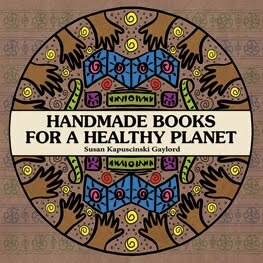 I'm a children's librarian and I purchased your book for myself and I'd love to have one for my library. I've been a recycler for 40 years and am intrigued by the new "upcycle" and "repurpose" movement of late. Thanks for your creative ideas. I've used the accordion fold with index cards books for a children's spiritual education class. They are making their own prayer books. They love it! Thanks for all the emails! I love the Wish Scroll, I think it would be lovely as a Gratitude scroll too. I subscribed to your blog in Yahoo reader. Thank you for sharing all your ideas! It is an inspiration. I love all of your ideas. I remember you coming to my school for a workshop several years back. I would be excited to win your book and use some of your ideas with my kindergarten class. just found your blog recently, lots of wonderful things, very inspiring. I've been making books for ages, and I NEED to use more recycled stuff! Thanks so much to all for the great comments. I love all of your ideas and the fact that you will sharing the project with so many different groups and ages.